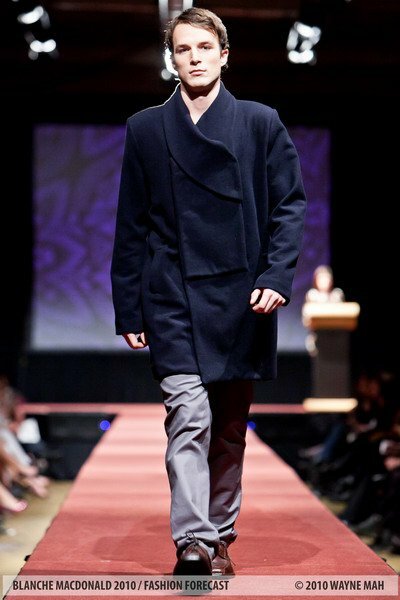 For Vancouver's fashion enthusiasts, the Blanche Macdonald grad show is always a November highlight with its high production value, upscale Westin Bayshore venue, and amazing display of fashion design talent. This year forty-five graduates presented two outfits each in a show titled "Fashion Forecast," and as always, the calibre of the graduate collections was bar none. I'd be hard pressed to choose a favourite designer among them, but here's a round-up of the show's highlights. Many student designers showed strong outerwear pieces this year with crisp lines and tailoring and a touch of menswear inspiration. Whitney Phuong channeled equestrian and military influences for both of her looks. Stella Ho showed a wearable cropped sleeve jacket that looked cozy and chic styled with knits. Sabrina Tang's oversized belted blazer took the boyfriend blazer to the next level with its soft lines and oversized belted fit. Shelley Dee Ediger put a unique spin on men's outerwear with an oversized asymmetrical shawl lapel. 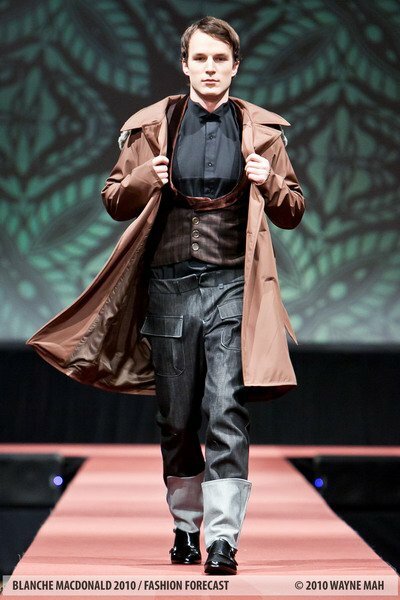 Beau Muncer's brown waterproof trench formed the outer layer of a dapper ensemble that drew appreciative murmurs of admiration from the audience. 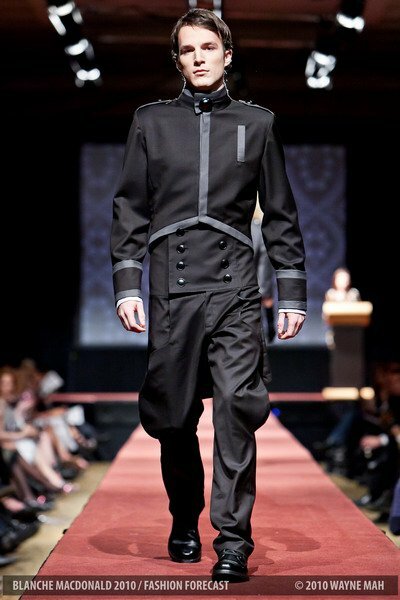 Although quite a few students used leather in their grad collections, my personal favourites were from Lorraine Cadena and Jillian Zdunich. Cadena showed a dramatic floor-length cutout gown over a tulle crinoline with artful gashes, a bandeau bikini, a hood, and deep side pockets. Both of Jillian Zdunich's outfits exuded relaxed ladylike seventies glamour. The leather insets in the trousers and the belted navy dress are wearable and on-trend with this season's looks. If this year's Blanche Macdonald show is any indication, jumpsuits aren't going anywhere just yet. Designers are experimenting with new silhouettes and details to update the ubiquitous one-piece. Katsuki Shimizu combined wide trouser legs with a puffed sleeve and one-shoulder silhouette. Wendy Man opted for a halter neckline and the elegance of beige silk and ivory lace. Yolande Eastwood chose to make her jumpsuit summer chic with a short bottom and boatneck on top. What would a fashion show be without some glamorous evening wear? Thia Nguyen's looks combined dreamy blues with airy yarn passementerie, creating an impression of coziness and ethereal lightness at the same time. Angela Lin demonstrated skills worthy of haute couture with her cage overskirt looks. 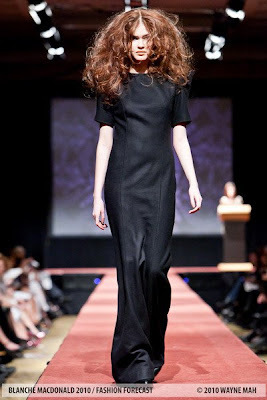 Richard John Talay constructed a black wool fitted gown with exaggerated shoulders and smooth seams that proved minimalism, when done right, can be more eye-catching than any froufrou frock. But the showstopper dress had to be Erin Johanson's: her cowl neck corset and ostrich feather skirt floated down the runway and back to hearty applause. Finally, a shout-out to Jill Kelsea, whose looks were so unique that I had a hard time fitting them into any one category. Her clothes showed playfulness and a skillful attention to detail. 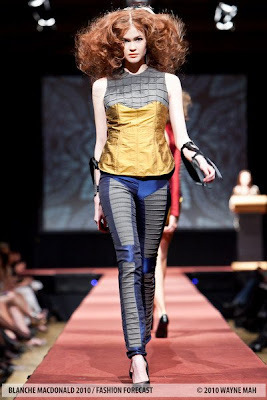 The contrasting insets and rows of carefully constructed seams gave the pieces an armor-like appearance. Congratulations and best wishes to this year's Blanche Macdonald grads. from you pictures my favorite is Ladies of the night. I love all the outfits from Ladies of the night. The other designers I love some of their outfits but not all. Miss Lisa! i would love to see how you are dressing for winter in Vancouver...early evening to night. I find that as it gets colder I'm bundling more..and getting fatter looking due to the more layer. I think I need to invest in a 100% wool coat to keep me warm instead of a 60% wool coat. I LOVE that pair of slacks with the leather insets. Gorgeous! i love the big, puffy, white dress - it's the kind of thing i'd want to wear to an evening ball!